#AnEyeForDetail: I *Dare* You To Look Away From PC's Rose Gold Eye Makeup! Priyanka Chopra is one of those people who look good without even trying. And when PC does decide to make an effort, you just can't look away! 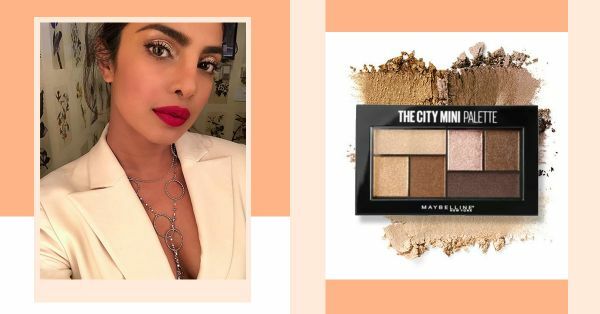 I spotted a recent photo of Priyanka while browsing through Instagram and I have to admit, I was smitten with her eye makeup. That stunning eyeshadow, slightly golden slightly rose got me thinking, a rose gold eyeshadow would be the perfect addition to my makeup kit. The eye makeup is perfect for day, night, wedding or brunch. So, I spent my morning swatching eyeshadows to recreate this stunning look. I shortlisted a few eyeshadow palettes and single eyeshadows that will help you ACE PC's rose gold eye makeup look. Check em' out! Before we get to the products, here's a quick tutorial on recreating the look. PS: It's easy peasy! 1. Use a cool toned brown eyeshadow with the help of a fluffy blending brush. Blend it into your crease using a small brush. Then apply a dark brown shade on the outer corner of your eye. Blend it well. 2. Use a flat eyeshadow brush to apply shimmer eyeshadow. Spritz the brush with setting spray and then dab it on your eyelid. Build up the intensity as you like. Spritzing a setting spray on your brush makes sure that you get the most pigment from any eyeshadow. 3. Finish the look with some eyeliner and oodles of mascara! If blending eyeshadow is not your thing, use a single eyeshadow to get the look. I recommend the Wet n Wild Color Icon Eyeshadow Glitter Single - Nudecomer (Rs 135) and PAC Pure Pigmented Eyeshadow - 89 Rose (Rs 300). Both of these are stunning rose gold shades that look good by themselves or paired with a detailed eye makeup look!